Here’s one of my looks from NYFW last week! This jacket has been on definite repeat in my closet and was a total favorite to throw on over pretty much everything I brought to NYC! It looked especially gorgeous against my new A.L.C. navy + green floral shirt-dress. The day started out cool, but warmed up in the afternoon, so this combo turned out to be the perfect ensemble! I was also eager to wear my new Stella McCartney crossbody – crossbody bags are a Godsend during fashion week, because you always seem to need to be handsfree for other things like your phone (for instagramming, but of course), coffee or your camera. I wore it the entire week and it was all I needed to hold my wallet, phone keys and lipstick. Unfortunately I didn’t have time to shoot all of my looks at fashion week, but I do have one more coming at you later this week. Happy Monday! Love that dress, the print is fantastic. This look is so nice and I can tell it is comfy too. 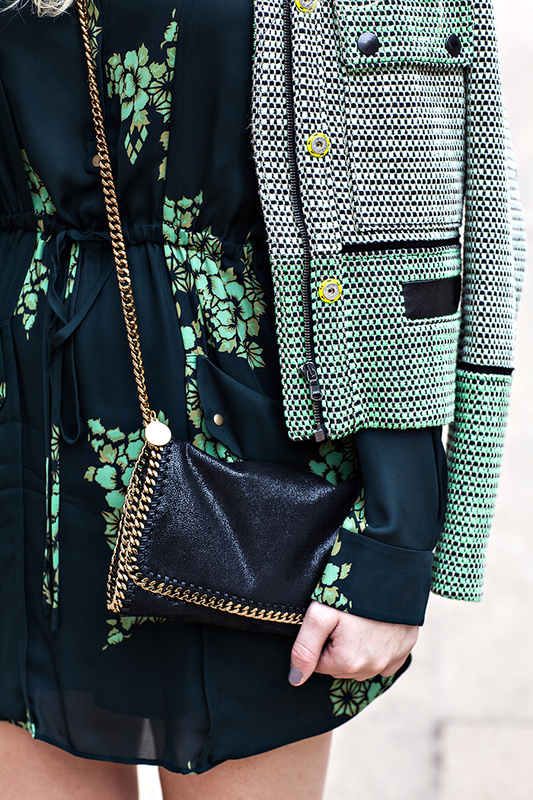 I love the mix of textures, and how the green in the jacket complements the floral print of the dress. I can’t wait to see more NYFW looks! I’m a sucker for shirt-dresses. I love this one! Especially with the green jacket, so fun! After seeing your photos and how you style your outfits I’m always inspired to try new things. Love these patterns together and the colors! I’m obsessed with your whole look! Happy Monday! I really like the dress Merritt! And what girl could live with out a crossbody bag? obsessed with this jacket, merritt! so, so cute. Oh that dress and that jacket are perfection! I love the shades of green. You have a beautiful blog. I really enjoyed looking at it. I adore that jacket! 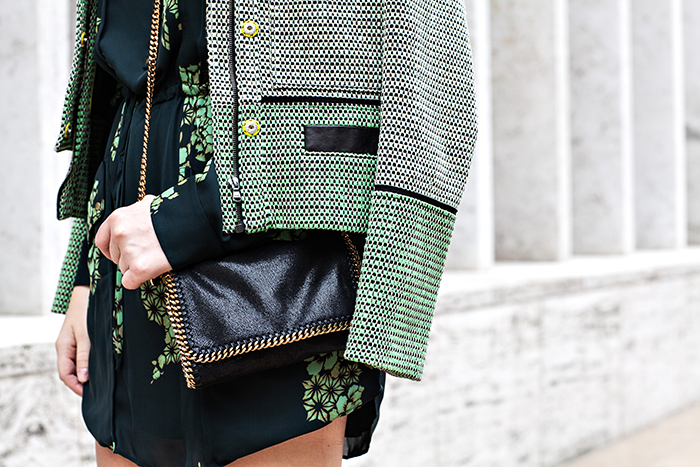 The textures and details are just amazing–I can totally see why it’s been a staple in your closet! I’m a huge fan of cross body bags too and love that they don’t give me a back ache (unlike when I carry around larger bags)… Hope to see more of your looks from NYFW!